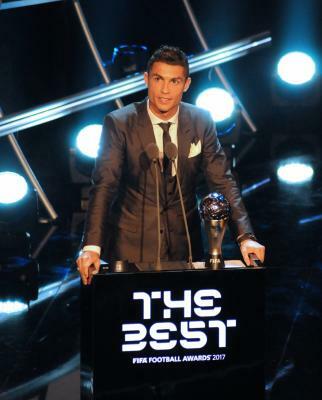 London, Oct 24 (IANS) Real Madrid star Cristiano Ronaldo was named the men’s player of the year at The Best FIFA Football Awards here. The Real Madrid icon was chosen ahead of Brazilian Neymar and Argentine Lionel Messi in recognition of his achievements over the past year during a star-studded function here on Monday night. The Real Madrid forward was also named in the FIFPro team of the year alongside clubmates Sergio Ramos, Marcelo, Luka Modric and Toni Kroos. In the FIFPro team of the year, Juventus’ Gianluigi Buffon was selected as the goalkeeper, while Paris Saint Germain’s Dani Alves and AC Milan’s Leonardo Bonucci were picked in defence, along with Madrid pair Sergio Ramos and Marcelo. “I am very happy, for me it is a great honour to receive this award at my age,” Buffon said. Arsenal striker Olivier Giroud won the FIFA Puskas Award for goal of the year. On accepting his award, Giroud said: “First of all I have to say it’s an honour for me. Real Madrid coach Zinedine Zidane was honoured as the top head coach. Zidane beat Italians Massimiliano Allegri (Juventus) and Antonio Conte (Chelsea), reports Efe news agency. “Thank you very much, this is a very special honour. I would like to thank all of my players who made this possible,” Zidane said after his name was called. The Frenchman received the award from Claudio Ranieri, who won the trophy last year after steering his former club, Leicester City, to a surprise Premier League title in the 2015-2016 season. The 45-year-old Zidane took the helm at Real Madrid in early 2016 and has already won a whopping seven titles so far, including two UEFA Champions League crowns and a La Liga title.